This weekend’s (20-22 July) Silverstone Classic powered by the AA will be the most entertaining and action-packed yet. Staged on the world famous Silverstone Grand Prix Circuit just two weeks after the Santander Formula 1 British GP, the event is already established as the world’s biggest classic motor racing festival – and 2012’s edition is all set to break yet more records. Once again both Silverstone’s National and new International Wing pits and paddock complexes will be maximised to house hundreds of the world’s finest historic racing cars which will be competing in a packed schedule of 24 races on the full GP track. With more than 1,000 entries the non-stop on-track entertainment showcases the full spectrum of motor sport history with huge grids featuring a mouth-watering array of Grand Prix, GT, Le Mans, single-seater, sports and touring cars spanning more than seven decades of epic circuit racing history. Adding to the spectacle more than 7,000 classic cars will be displayed during the weekend on the Silverstone infield with many hallowed marques celebrating important milestones in their evocative histories. Notably the busy Sunday schedule includes a world record parade of 70 Ferrari F40s to mark the stunning supercar’s 25th birthday. With a total of 1,104 race entries the 2011 Silverstone Classic is believed to have been the biggest race meeting ever staged in the world, while the 80,000 attendance was unprecedented in the event’s recent history. Last year’s Classic also established a new Guinness World Record for the ‘largest parade of Jaguar cars’ when 767 E-types took to the track to celebrate the iconic British sportscar’s 50th birthday. 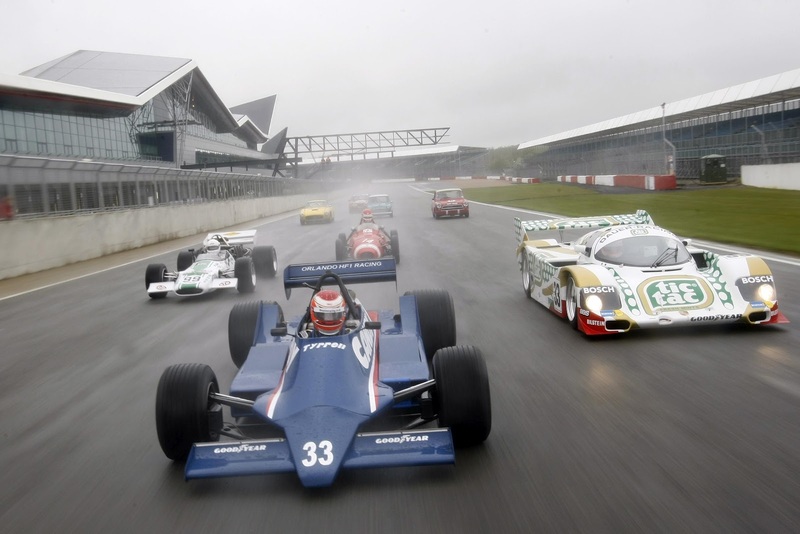 The 2012 Silverstone Classic will witness no fewer than 24 races, many boasting full 58-car grids. The impressive line-up includes the finest historic racing cars covering more than eight halcyon decades. The wide-ranging race card features no fewer than 100 Grand Prix cars plus spectacular grids of Le Mans, GT, Group C, Jaguar E-types, sports and touring cars providing the very best of nostalgic race action. Among many highlights is the re-birth of the Daily Express International Trophy, one of the most famous prizes in motor racing history. Past winners include greats such as Stirling Moss, Jim Clark, Jackie Stewart and Graham Hill. This revived race will be for F1 cars from the Seventies and Eighties. A special celebrity race starring famous faces from the high-profile worlds of music, sport, media and show business is now an annual attraction. Those donning race suits and helmets include: Heston Blumenthal; Brian Johnson; ‘Comedy Dave’ Vitty; Jay Kay; Brendan Cole; Steve Bull; Andrew Castle and Sir Patrick Stewart as well as TV soap stars representing Coronation Street, EastEnders and Emmerdale. As in 2011, all the stars will be lining up on a grid of competition-prepared Morgan racing cars. Special races dedicated to the memory of two of motor sport’s most respected figures, Peter Gethin and Alan Mann, will be among this year’s highlights. The Peter Gethin Memorial Trophy is dedicated to the memory of F5000 racing legend Peter Gethin who passed away in December while the Alan Mann Trophy hails the achievements of Alan Mann whose Alan Mann Racing team was revered in touring and sportscar racing circles in the Sixties. Although Mann passed away in March of this year many of his evocative red and gold cars are still competing today. Backed by the Automobile Association – the UK’s biggest motoring organisation – AA World is perhaps the most significant new attraction for 2012. 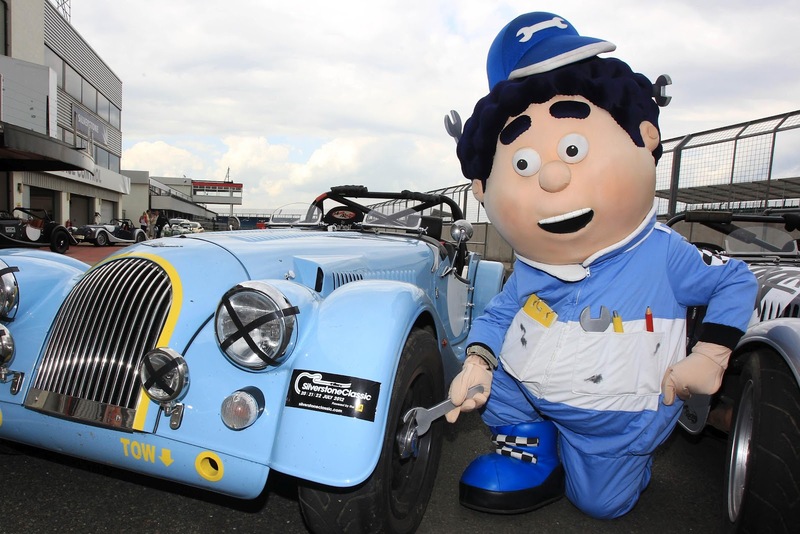 Based right at the heart of the venue, this new motoring theme park will be the UK’s largest interactive motoring attraction for all ages from Roary The Racing Car and Wacky Wheelers for toddlers and children to a taste of driving at Silverstone for under-17s. AA World will be opened by 1992 Formula One World Champion Nigel Mansell, CBE at noon on Friday 20 July. The Silverstone Classic is one of the must-see events in the diary of every car enthusiast – that’s why the event has become a major highlight on the calendars of more than 120 motor clubs. During the weekend more than 7,000 classic cars will be on show. This summer car clubs will be celebrating special milestones in model, marque or their own histories, notably golden anniversaries for the Lotus Elan, Triumph Spitfire and AC Cobra. The Silverstone Classic has also been selected by the MGB50 Committee as one of just three official celebrations to mark 50 years of the much-loved MGB. A world record gathering of mouth-watering Ferrari F40s (numbering 70 and counting…) will celebrate 25 years of the idolised Italian supercar – rated by many to be the Prancing Horse’s greatest creation – with a special parade on Sunday. The UK’s first-ever BMW ‘Z-fest’ will be staged at this weekend’s Silverstone Classic. Organised by the official BMW Car Club GB, the nation’s inaugural Z-fest will see many hundreds of BMW’s popular Z1, Z3, Z4 and Z8 sportscars on display. Living up to its ‘Rocking and Racing’ tag, the Silverstone Classic is renowned for its live rock concerts staged on both Friday and Saturday evenings. This year’s impressive line-up includes chart-toppers Adam Ant and Mike & the Mechanics. For those wanting to buy a classic road or racing car, Silverstone Auctions is staging a special sale in the venue’s stunning ‘Wing’ building. A wide range of desirable cars and automobilia will be going under the hammer with viewing on Friday and Saturday mornings before the bidding starts at midday on the Saturday (21 July). With classic car sales running at record levels the auction is certain to generate huge interest from both collectors and market observers. There’s so much more fun for all ages to enjoy at the Silverstone Classic with a vintage fun fair, go-karts, aerial displays with wing walkers, the Parachute Regiment The Red Devils, hot air balloons, Punch and Judy (celebrating 350 years), rally car and 4x4 experiences plus giant TV screens showing all the on-track action. There is even a pampering centre plus a retail village with nearly 200 exhibitors presenting a wide range of autojumble, automobilia, art, jewellery, books, videos and gifts for everyone. Another traditional Silverstone Classic forte is its widely-praised ‘access all areas’ policy. General admission tickets include FREE entrance to all live music shows, AA World, trackside grandstand seating and both the International and Wing pits and paddock complexes. Adult tickets for 2012’s Silverstone Classic powered by the AA (20-22 July) cost from as little as £35 (plus booking fee) and special two- and three-day weekend tickets are also available with savings of up to 20 per cent if purchased before 5pm on 19 July. Full details are available via the event’s official www.SilverstoneClassic.com website.